The peeled skin of an orange should be dried under the sun for 1 hour and then cooled under the fan for another hour. Then it is cut into small pieces. These should be roasted under low flame for 5 minutes to drive away the remaining moisture. Remove and keep aside. Take a tbs of sesame seeds and roast and powder separately. Fry ½ cup of black gram dAl in oil with 15 red chillies (small) and tamarind of marble size broken into small pieces. After the dAl becomes golden brown remove and grind with the orange skin, salt, ¼ tsp asafetida and 1 tsp sugar into medium coarse powder. Now add the sesame powder and grind for 2 minutes. Can take with cooked rice and oil using porichcha kUTTu as side dish. Except curry leaves and asafoetida, roast dry all the other ingredients separately well till they become golden brown in colour and leave a fine roasted aroma. Keep aside. Fry the curry leaves with a little oil for 5 minutes and add asafetida and fry for 1 more minute. Remove from fire. First powder the dAl into semi fine texture and then add all the ingredients and grind for 5 to ten minutes to get a nearly fine texture. This poDi is very good for health, keeps the diseases away, protects from BP, diabetes, prostrate irregularities, cancers, purifies blood etc. if taken weekly once. It is used for nursing mothers to protect them in the three months next to delivery. Very good for diarrhoea without ghee or a little ghee. However, these are being grandmother’s treatments, I disclaim any responsibilities, even though our ancestors and personally I had tried it and found to be very good for several problems. Take it with cooked rice and ghee along with porichcha kUTTu or suTTa appaLam as side dish. Take oil in a KaDAi and fry the red chillies for 2 minutes along with tamarind broken into small pieces. Add coriander seeds and fry again for 2 minutes. 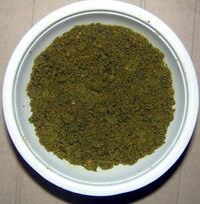 Add curry leaves and fry for 2 minutes and then add asafetida and fry for 1 minute and remove from fire. Keep aside. Now roast the dAls separately till you get fine aroma and they become golden brown in colour. Roast the sesame seeds separately till they splutter. Roast the copra shreds separately for 1 minute or till they become pinkish. First grind the sesame seeds for 1 minute and then copra for 1 minute. Remove and keep aside these. Then powder the dAls with fried red chillies, curry leaves, tamarind and asafetida adding salt and sugar little by little till they become nearly fine powder. Add the sesame powder and copra powder finally and grind for 1 minute. Use it with oil and cooked rice along with porichcha kUTTu, aviyal, mOre kUTTu, mOre kuzhambu or fried appaLam. Take oil in a kaDAi and fry curry leaves for 2 minutes till the water goes away. Remove and keep aside. Now roast in the kaDAi all other ingredients except salt and sugar. Remember to roast tamarind with these, in pieces and not in a lump. Grind the curry leaves for 1 minute and keep aside. Grind the dAls and other ingredients into a nearly fine texture powder and then add the powdered curry leaves to rotate for another 2 minutes. Remove and store. Can take with cooked rice and oil. 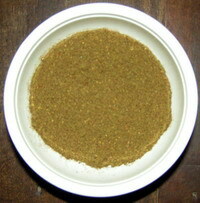 Porichcha kUTTu, suTTa appaLam, mOre kUTTu, mOre kuzhambu or aviyal goes well as a side dish. 01. Some people fry MaNittakkALi vaTral in oil and then take it with cooked rice by powdering it by hand and adding ghee. No salt is needed to be added as the vaTral itself has salt. 02. In this way some roast dried neem flower for 1 or 2 minutes to make it crisp; fry in oil a red chilli and a little coriander seeds and then grind all these into powder of nearly fine texture along with salt to taste. 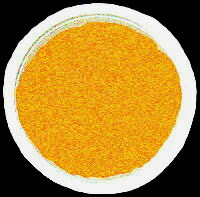 This powder is also taken with cooked rice and ghee. This is good for killing worms in intestines and to protect skin from various ailments. This entry was posted on May 17, 2011 at 11:14 pm and is filed under PoDi with tags ajwain, angaya podi, asafoetida, Bengal gram dal, Bishop weeds, black gram dAl, blood pressure, blood purification, cancer, chutney podi, coriander seeds, cumin seeds, curry leaves, diabetes, diarrhea, dried black night-shade, dried neem flowers, dried prickly nightshade, grated copra, intestinal worms, kariveppilai podi, maNittakkALi vaTral, nursing mother, omam, orange skin powder, podi, prostrate ailments, red chillies, refined oil, salt, sesame seeds, skin diseases, split gram dal, sugar, sundaikkAi vaTral, tamarind, til, vEppampU. You can follow any responses to this entry through the RSS 2.0 feed. Both comments and pings are currently closed.